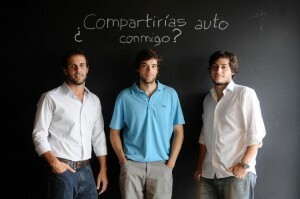 EADAAlumni’s Entrepreneurship Centre is pleased to announce that SincroPool (a project headed by Martín Rubio, Master Especializado en Finanzas 2011, and Lucas Croxatto, International Master in Finance 2011) has won first prize in the prestigious “Competencia NAVES: Premio a las mejores ideas de negocio” (the NAVES Contest: awarding the best business ideas) organised by the IAE Business School’s Centro de Entrepreneurship in Buenos Aires, Argentina. SincroPool is an online car sharing platform for companies and organisations. It makes it easier for participating institutions to take part in CSR initiatives while cutting costs and reducing pollution. The start-up passed the NAVES initial screening where it competed with over 200 projects taking part in the contest. Ten finalists were chosen and divided into two categories: Business Idea and Start-up Company. SincroPool won first prize in the category of Start-up Company. The IAE’s Competencia Naves, which just celebrated its 13th year, has become the leading entrepreneurship contest in Argentina. It accepts winning projects from other contests throughout the country, which compete in a final round with projects taking part for the first time. It is regarded as the contest to end all other contests in Argentina. This is not the first time that this entrepreneurship project has won a prize. In May, SincroPool was selected in Telefónica’s Wayra project 2012 in Buenos Aires as well as the Programa Primera Exportación Contest organised by Fundación Gas Natural Fenosa in Argentina.